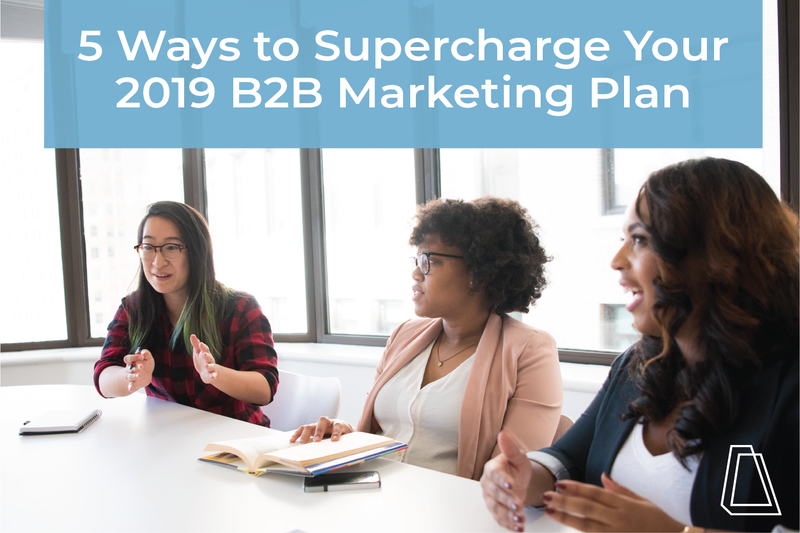 The new year is underway and many business owners are solidifying their 2019 B2B marketing plans (or if you’re a bit of a procrastinator like me, perhaps just starting your plan). Whichever camp you fall into, I wanted to share a few strategies to supercharge that marketing plan and help you have your most successful year ever. The first step to starting a new year strong is reviewing last year’s results, evaluating what worked, what didn’t and setting goals for 2019. When it comes to reviewing past performance, it’s easy to get overwhelmed by metrics: visits, clicks, likes, shares, comments… there are so many ways to measure what you’re doing in marketing. These can be useful, particularly to track progress (or lack thereof) for a particular strategy. However, I would encourage you to focus less on those “vanity” metrics and more on actual results: which marketing activities brought in leads and contributed to new business? Look at where you spent money and how much of a return you got for each tactic. After you understand what worked and what didn’t, it’s time to apply that knowledge to 2019. The first step to creating your 2019 marketing plan is to set S.M.A.R.T. goals; this will give your plan direction and focus your efforts. Are you trying to attract new leads? Build stronger relationships with your customers? What are your revenue goals and what are the smaller goals that will help you get there? Once you know who you’re targeting, understand them deeply through buyer personas and have mapped out the buyer’s journey for your business and customer, you will have much more clarity moving forward with your plan. You know your target market and understand those buyers, which is extremely important from a marketing point of view. This allows you to segment email lists or ad audiences based on your targets and create marketing content that appeals to each buyer. While working a large list or audience should probably be part of your marketing plan, you may want to prioritize account-based marketing. Account-based marketing simply means creating a list of your top 25-50 prospects and targeting them specifically with 1:1 marketing messages through email or social platforms. You can even target specific companies and individuals with LinkedIn advertising. Use this article as a guide. If your 2019 B2B marketing plan doesn’t include video, you’ve done something wrong. I could throw out countless statistics about the importance of video for business, like how video generates 1200% more online shares than text and images combined or how adding a video to your landing page can boost conversions by 80%. But I think we can all agree—video is big, it’s getting bigger and it’s an essential tool in every marketer’s toolbox today. If you need proof of the power of video, check out our CEO’s LinkedIn profile. Jackie started posting regular LinkedIn videos in 2018 and saw a huge response, which has already translated into new business for our agency. If you’re getting nervous, take a deep breath and relax. I know video marketing can seem scary (and time-consuming and expensive and difficult to execute). But given today’s technology, namely that phone in your pocket, anyone can create marketing videos that drive results. Here are some excellent tips to get started, from how to make the most of your smartphone to how to ensure quality lighting and sound. Need a little help with your 2019 B2B marketing plan? That just happens to be our specialty! Learn about how Accelity Marketing can help you put together a marketing plan that will propel your startup to success.